I have been scouring the internet trying to find a good quality, but inexpensive pair of bib cycling shorts. I already had a pair picked out from Bike Nashbar.com that were on sale for $30. They were black with red at the bottom, which perfectly matched my red and black theme, but when I had the money to buy them yesterday, they shot up in price to $45. I was back to the drawing board. My hunt for a good quality pair of bib shorts at a reasonable price started over from scratch and I had to scour the internet again. Unfortunately, bib shorts are expensive. I have seen them go for as low as $100 and as high as $300. They are just too expensive for my budget, so naturally my only option was to go back to Nashbar and see what they had and read the reviews before making a final decision. The shorts (image above) that I bought have the padding in the back, which is what I need for my ergo bicycle seat. Although I’m sure it’s not enough padding, but that’s the only padding I’ve seen so far for bike shorts so it will have to do. If it doesn’t work out then I’ll try a new bicycle seat, preferably a beach cruiser seat. I’d like to keep my $70 ergo bicycle seat because it won’t make me impotent like a regular bike seat would (which it was doing and why I had to buy an ergo bike seat). The shorts that I bought are called Nashbar Gel Ride Bib Shorts and they were $40. I know, I could have spent $5 more on the ones that I wanted with the red, but I figured with shipping and tax, it would end up being much more, and it was $50 with shipping and tax. I guess $5 still wouldn’t have mattered, and in retrospect I’m starting to wish I spent the extra $5, but that’s fine. I really don’t care what color they are as long as they do the job I need them to do. Of course I will update this post when I get the bib shorts with my findings of the fit and feel and the feel of the gel on my ergo bicycle seat. I wanted to buy a shirt to go with the bib shorts, but couldn’t afford to spend any more at Nashbar.com. 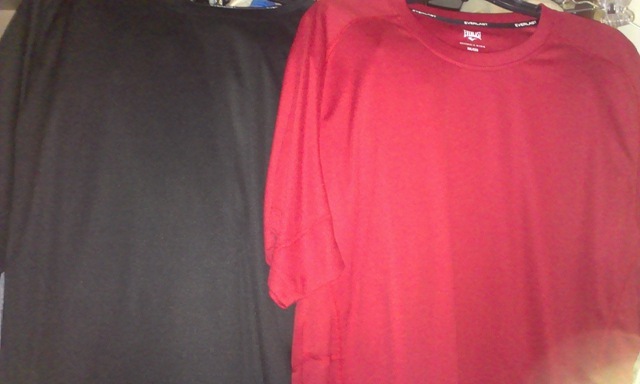 We went to Sears to pay the bill and to buy a new scale and they had EverLast sport shirts on sale for $10 each. They are the kind that wick to keep you dry, which is what I needed. Here they are. Red and black.